Actvity Summary: Particular attention will be given to characteristics of settings close to the ice (ice-proximal) and far from the ice (ice-distal) in high-latitude settings. This set of investigations focuses on the use of sedimentary facies (lithologies interpreted to record particular depositional environments) to interpret paleoenvironmental and paleoclimatic changes in Neogene sediment cores from the Antarctic margin. 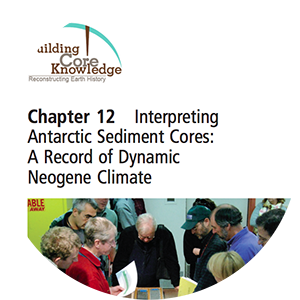 In Part 12.1, you will build your knowledge of polar sediment lithologies and the corresponding facies through conceptual diagrams, geological reasoning, and use of core images and core logs (a graphical summary of the sediments). In Part 12.2, the core log for the entire 1285 m ANDRILL 1-B core is presented. You will characterize each of the key lithostratigraphic subdivisions and use your knowledge of depositional facies to write a brief history of the Neogene climatic and environmental conditions in the Ross Sea region. In Part 12.3, you will use your core log reading skills and facies knowledge to evaluate patterns in the Pliocene sediments from ANDRILL 1-B. You will correlate quantitatively patterns in your dataset with cycles in insolation, influenced by changes in the Earth’s orbit during the Pliocene.